During the 2012-2013 school year San Domenico School printed more than one million pages of copy paper. Being a 1:1 iPad school with a unique emphasis on sustainability this was a shocking statistic for many of us to learn. Being a school we recognize that paper is an important part of the learning process. However, being a 1:1 iPad and Apple Distinguished School, we know we have to do better and reduce the emphasis on paper usage. With a new copier lease contract we will be putting greater emphasis on three major areas of digital imaging designed to reduce the number of pages we print and improve the workflow for our documents. It may seem simple but we don't always think to print two-sided. Our new Ricoh copiers will allow us to deploy double-sided ready print presets. 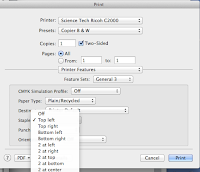 Staff may prepare a number of different preset options to both speed up the printing process and reduce the number of pages they print. Staff enter the different parameters for their print job (including Two-Sided, B & W or color, stapling, hole punching, etc.) 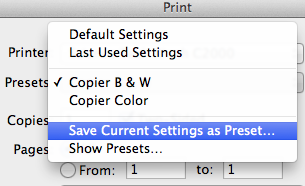 then simply save these settings as a "Preset" which are available each time they go to print. Using electronic documents are a great way to minimize the use of paper. There are many documents we want to share with our colleagues and students each day. 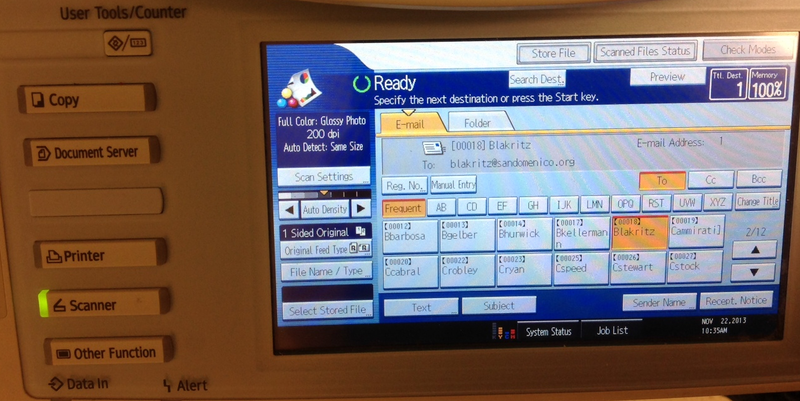 Using the copier's Scanner functionality makes it easy to scan and send a document to a user E-Mail address. Users simply scroll through the user directory and select their name from the list. 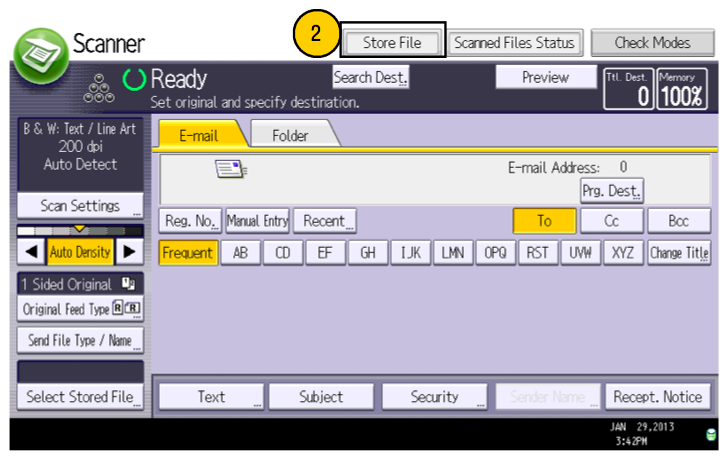 Using the already populated E-Mail address the copier can scan multiple pages into a single document and send directly to your account. Note: Resolution settings and the number of pages you scan will determine the size of your document once it is scanned. Please try to keep your file sizes small enough to send within our system. If you require high resolution scanning please use the Scan to USB Flash Drive and SD Card method. Our new copiers allow users to scan files directly to USB Flash Drive and SD Cards. To do this simply choose the Scanner option in the home menu. Click the option to "Store File" and choose "Store to Memory Device." 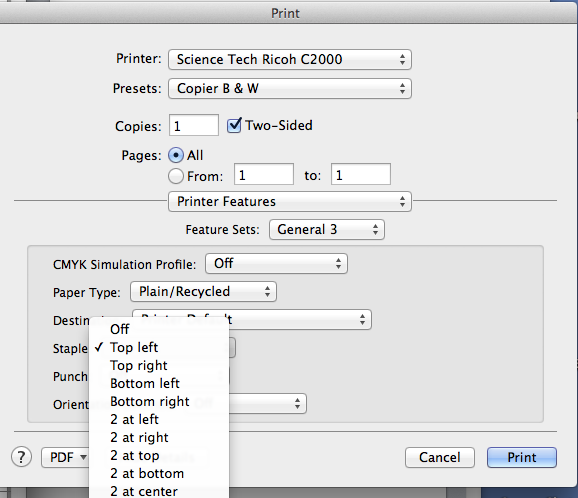 Choose the type of device you inserted in the copier and press the "Start" button. You can scan multiple pages into a single file. When you are finished scanning press the # key to complete the scanning process. Our hope is that implementing new copiers with easier access to digital imaging, combined with the use of cloud resources like Moodle, Turnitin.com, Box, and Google Drive, will both improve how we teach and learn but also help us to reduce the number of pages we print each year.